Shine North are developing a new TV show that shows just how useful dashcams are in capturing life out and about on Britain’s roads, from accidents, near misses and road rage incidents to the more humorous and bizzare events that you often glimpse through the car windscreen. They would like you to be their eyes and ears out on the road and if you think you’ve managed to capture something interesting with your dashcam they’d love to see your footage. If they use your video in the show you’ll receive a free £50 Marks & Spencer voucher. If you have a video you'd like to send us, we recommend you send it to us using WeTransfer. Simply visit www.wetransfer.com and enter our email address sales@carcamerashop.co.uk to send us your files. Make sure to include your email address and name so that we can contact you afterwards. If you have any problems sending your video to us please get in touch and we can help. Vouchers will be sent only if your video is used in the TV programme. Only 1 voucher will be sent per person. Offer only valid to UK residents over the age of 18. 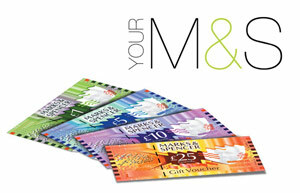 The voucher is a £50 M&S voucher.